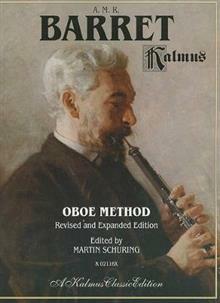 The Oboe Method, long a standard text for oboists, will assure ease of play for advancing oboists. This newly engraved and revised edition, edited by Martin Schuring, corrects the mistakes and inconsistencies found in Barret's original publication, and has been expanded to includ... read full description below. By Barret, A. M. R.
The Oboe Method, long a standard text for oboists, will assure ease of play for advancing oboists. This newly engraved and revised edition, edited by Martin Schuring, corrects the mistakes and inconsistencies found in Barret's original publication, and has been expanded to include all of the sections of Barret's original publication studied by oboists today. Sections: Excerpts from Barret's Principles of Music * Thirty Scales for the Study of Articulation * Twelve Articulation Exercises * Forty Progressive Melodies * Four Sonatas * Sixteen Grand Studies.